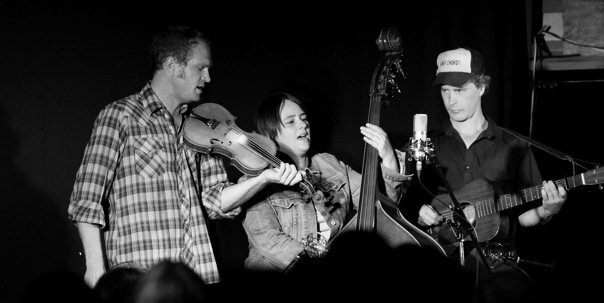 Oldtime pickers Foghorn Trio passed through my town about a week ago and kindly left behind a copy of Nadine and Sammy’s new record titled “Granddad’s Favorite.” It’s a lovely collection of oldtime country and Cajun songs and fiddle tunes that seems to have gotten permanently stuck in my CD player. 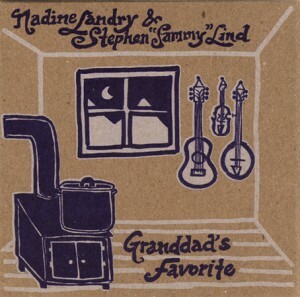 Stephen “Sammy” Lind is the fiddler at the heart of Foghorn’s wall of sound, and his partner Nadine Landry is a native of Canada’s Yukon Territory with French Quebecois family roots. This is oldtime acoustic country at its finest, with a very pleasant Cajun twist. Buy this record, support pure-core traditional Americana musicians, and you won’t be disappointed. Fiddlefreak recommended! Man, I LOVE that song Tippy Toeing. Go Nadine! They played that track with the full honky-tonk Cajun band in San Antonio and KILLED it!